Two women were hospitalized after a dog attack by this morning at the Covered Bridge Condominium Complex at 5005 Georgi Lane in Houston. According to a Channel 2 News report, Sonny Pena’s two-year old Boxer named Rocky attacked the two women just before 7:00 a.m., inflicting serious injury, primarily to the women’s legs. A Houston firefighter who arrived to help was then bitten by another of Pena’s dogs, a 3-year old Lab named Apollo. Both dogs are now being held under a 10-day quarantine by BARC – Bureau of Animal Regulation and Care. The dogs will not necessarily be automatically euthanized: if a Justice of the Peace determines they are dangerous dogs, Pena may have to pay an annual special registration fee and carry liability insurance. Pena reportedly told Channel 2 that he was surprised by the attacks since the dogs had never showed signs of aggression before. Assuming Pena is a resident of the condo complex and has homeowner’s insurance, the women would probably be able to make an insurance claim to compensate them for medical expenses, any scarring and physical impairment resulting from the dog attack (though of course, whether the insurer would pay is another matter). A 12-year old boy was rushed to hospital this past Monday morning when a neighbor’s pit bull dog escaped and bit him on the arm. According to Channel 11’s report, the boy was walking to school in the 7900 block of Bauman Road when the attack happened. 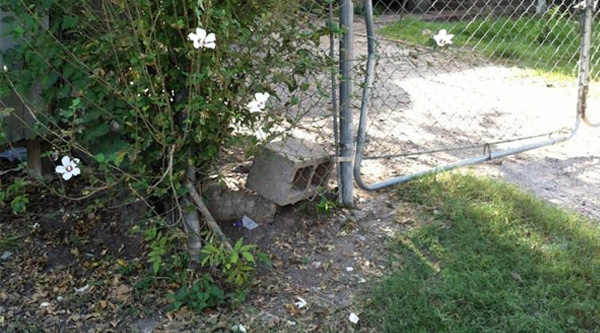 Investigating officers said it appeared the dog has pushed a cinder block to the side and escaped through a gap in the home’s fence. One boy said this was not the first time the dog had attacked and recounted another incident when the dog started to bite and rip the pants of kids walking past the home. The dog’s owner Raydene Ambriz however claims the dog is frequently provoked by kids who will kick at the fence or throw stones at the dog. Fortunately the boy’s injuries were not life threatening and he was taken to LBJ Hospital for treatment. The pit bull will be quarantined by BARC for 10-days and checked for rabies, a standard procedure when a person is bitten. To learn more about Texas law on dog bites and when a dog’s owner may be liable for bite victim’s injuries, visit Houston personal injury attorney law firm Smith & Hassler’s web page on dog bite injuries. A 13-day old baby boy died as a result of a pit bull attack at his grandparents’ home in Cypress. The newborn’s name has been released by the Harris County Institute of Forensic Sciences: his name was Braydon McCollen. According to Harris County Sheriff’s Department investigators, Braydon was asleep in a cradle in the office of his grandparents’ Cypress home when the dog, described by neighbors as a 100lb pit bull, entered the room. Braydon’s mom was outside using the phone and watching him through the window: the dog sniffed Braydon and then attacked him. A neighbor ran inside and called 911 while Braydon’s grandfather applied pressure to the wounds, but unfortunately the wounds were too severe: Braydon was taken by life flight helicopter to Memorial Hermann Hospital where he died a few hours later. 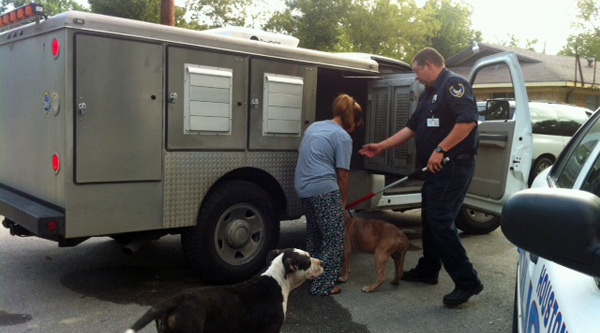 The dog is currently in the custody of animal control and is subject to a 10-day quarantine. Channel 2’s story is here. Our hearts go out to Braydon’s family. What a terrible tragedy. 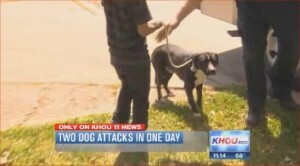 Click2Houston.com is reporting a dog attack on a man in Porter, Montgomery County on Tuesday April 19, 2011. The attack happened around 5:00PM at Needham Road and Ford Road. According to investigators the man was attacked by two dogs while walking along the road; he was transported to Memorial Hermann Hospital in The Woodlands. A witness named Travis Huffman said he saw the man being attacked by two dogs and that the man had been forced down into a ditch. A neighbor named Marcus Pillow said the man’s arm was broken in two places during the attack and the victim’s stomach and neck were also injured. 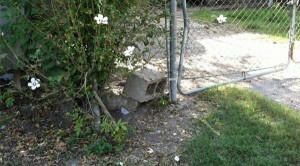 No information was released on the identity of the dog’s owners or what criminal charges may be filed, if any. If you or a family member have been injured due to a dog bite or other animal attack, call Smith & Hassler and one of our experienced Houston personal injury attorneys will be glad to give a free consultation. Houston police are reporting that a teenager took a pit bull dog from a neighbor’s apartment in Houston on Thursday; while the teenager was playing with the dog, a 4-year old boy shot a cap pistol at the dog. The dog became agitated and bit the 4-year old on his face. The 4-year old was taken to a hospital and is expected to recover from his bite injury. The teenager who took the dog was arrested but police are not saying what charges he faces. Animal control took the dog into custody and will determine whether the dog can be returned to its owner or is too dangerous and needs to be euthanized. 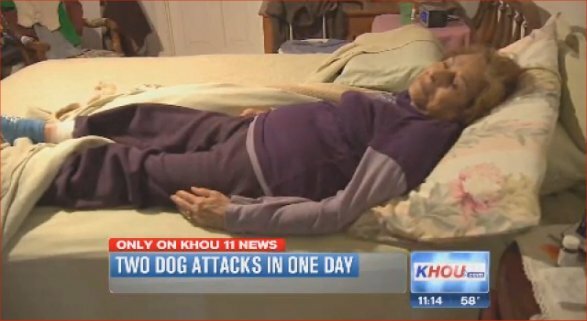 An 83-year old lady in Tyler, Texas is recovering after being bitten by a pit bull mix dog that authorities say may have been used in illegal dog fighting. Glynda Hulsey and her two dogs were walking to the mailbox when she was attacked. Fortunately she was able to make it back to her house. The pit bull followed her where it was shot by her husband. ABC Channel 13’s report is here.